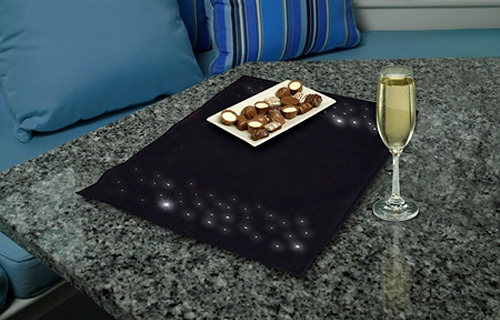 Sylvania LED Placemat | OhGizmo! By Andrew Liszewski on 06/04/09 • Leave a comment! Have you ever tried to eat dinner at 2:30 in the morning during an eclipse while in the middle of a power outage? Let me tell you, it’s almost impossible to see what you’re eating! Thankfully the forward thinkers at Sylvania have come up with the perfect solution. Through some manner of reverse-engineered alien technology they’ve found a way to embed LED lighting into your standard terrestrial placemat. You’d think that such a breakthrough would have been confiscated by the government, placed in a non-descript wooden crate and buried somewhere inside a giant warehouse, but believe it or not they’re actually available for sale to the public! On a single set of coin cell batteries the placemats will stay lit for about 20 hours, and they’ve been treated with Scotchgard so they’re also spill-friendly. And they’re available in sets of 2 from the Sylvania online store for $24.99.